Volume normalization is a digital media outlets way of trying to minimize the volume differences between millions of audio uploads. Each media outlet (streaming service, digital music platform and in some cases media players) uses their own slightly different standard to manipulate volumes upwards or downwards in order to even out the difference for consumers. What does this mean for mastering and the choices related to perceived volumes? Here is an approximate guide to perceived volumes and issues that might arise from various perceived volume choices during audio mastering. I have not listed RMS value or LUFS (loudness units full scale) values as defining an absolute is not appropriate. Determination of a low or high volume is somewhat dependent on musical genre, acoustic vs synthetic instruments and instrumental/arrangement density. At this time various standards are being used by different media outlets and players (Spotify, iTunes, YouTube, Google Play etc.) meaning that there are likely to be tweaks to existing normalization standards as time moves onwards. It has been anecdotally reported that some systems also employ limiting under some circumstances as well as gain adjustments. Therefore only approximate guidelines can be provided. We can hope that in the future that the major distributors of music will decide on a standardized volume level. Will sound very good on FM radio transmission (given advanced station audio processing) and internet stations with advanced audio processing. Full dynamics left alone meaning no additional distortion from heavy limiting. Minimal effects introduced by volume normalizing systems in iTunes, Spotify and YouTube etc. Mix balances dynamically respected and retained. Drum and percussion transients remain in tact. In some cases such as commissioning rounds (radio play list decision making meetings) the track may sound quiet compared with competition. The CD version might sound a bit quiet in computers and CD players. Record label in some cases may complain the release is not competitively loud. Most of dynamics left in place. Few detrimental effects from volume normalization systems. In some cases such as commissioning rounds (radio play list decision making meetings) the track may sound a little quiet compared with competition. The CD version might sound a little bit quieter than other releases on computers and CD players. CD will start to approach what has been “average” release levels for the last 5 years and less likely to receive “it sounds quiet” commentary from the label. Can add extra subjective “bite and grit” on aggressive music styles. Will approach competitive levels in a club/festival situation where a DJ is not compensating for varying perceived volume levels by using pre fade button and channel gain. Fidelity issues will start to creep in, loss of punch, distortion, undesirable squashing on peaks, less depth (front to back positional information gets changed) and width, loss of impact from restricted long and short term dynamic control. Will start to suffer fidelity issues when broadcast on radio, possibility of a distorted, harsher and splashier sound. Long term dynamic changes will be lost potentially reducing overall impact and power of louder sections of audio. Increased chances of listener fatigue. Will sound as loud as “competition” on non volume normalized reproduction systems. Can be subjectively pleasing when mastered by an expert on the most aggressive and hard hitting music styles. Will sit along side competitive levels in a club/festival situation where DJ is not pre fading music and compensating for varying perceived volume levels by using channel gain. Very unlikely to sound good on radio, will sound even more distorted and processed. Complex musical passages with rich harmonic content can end up producing an ill defined sound that in worst case depletes musicality (presentation of nuance, melody and harmony/harmonic balances) and details. On non aggressive styles of music the distortion will significantly reduce subjective fidelity. Will sound less powerful have less impact and sound flatter and sound more distorted (and possibly quieter) on volume normalized systems. Will cause listener fatigue. Listener may wish to turn your music down. Clients choose mastering to ensure optimal translation foremost and to subjectively enhance their releases in a very accurate environment with euphonic tools. 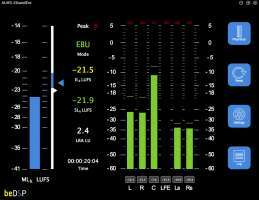 Perceived volume should be a secondary aspect of mastering, in recent years it has taken greater priority over fidelity in some cases. If you have only budgeted for 1 master, a master should be created which has a moderate volume increase dependent on genre. Mastered with care to preserve musicality whilst providing a volume boost that is not detrimental to fidelity. Performed by an experienced professional in conjunction with high end analogue and ear selected digital tools the end result can be a great improvement on the original mix. Allow me to be clear: I can make masters very loud if ultimately required with the least side effects and have significant skills in doing so. However for completeness and professional awareness sake, today a secondary lower level version can be considered to suit volume normalized platforms.